Over billions of years of evolution, nature has created its vast tapestry of life out of a surprisingly small toolbox: just four DNA “letters” that, in combination, code for only 20 common amino acids, the building blocks of proteins. Researchers have successfully mined nature for substances created with this defined palette to treat some diseases — but imagine the possibilities if they could build on the lessons they’ve learned from nature using a whole new toolbox. For the first time, a team led by scientists at the University of Washington has designed certain peptides, or small proteins, that have chemical properties that would make them ideal starting points for new drugs. Another first was their designs’ use of amino acids not typically found in nature. “What we haven’t been able to do is come up with a way of saying, ‘Okay, here’s a new problem where no natural peptide that we know of exists. We want to make a new peptide drug and solve this problem.’ We didn’t have design tools that allowed that,” said the UW’s Dr. Vikram Mulligan, one of the first authors on the paper describing their methods for opening up this new toolbox, which was published Wednesday in the journal Nature. The team created new algorithms to design these molecules, called constrained peptides because the peptides’ shapes are bound tightly in place with chemical bonds. Constrained peptides are found throughout the natural world, often as toxins or defensive compounds. 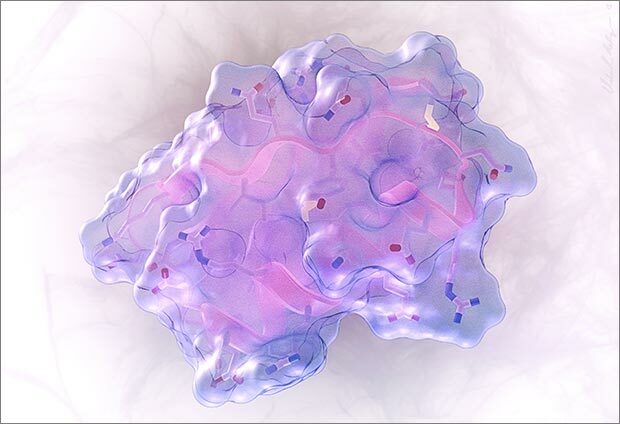 With their small size and precisely shaped, rigid structures, such proteins are highly specific for their targets and chemically stable — desirable qualities in a drug that must have as few side effects as possible and withstand the tough environment inside the human body long enough to do its job. Constrained peptides hold incredible potential for development into therapeutics to hit targets that traditional drugs cannot, said study author Dr. Colin Correnti of Fred Hutchinson Cancer Research Center. Correnti is a member of the Project Violet team at the Hutch, led by Dr. Jim Olson, which is creating drug candidates based on natural constrained peptides. “This is the very early stages in this space, but that is the promise: That we may be able to do things that [other drugs such as] small molecules can’t, that antibodies can’t,” Correnti said. And thanks to their new methodology that allowed them to expand their design repertoire outside of the standard toolbox of 20 amino acids, the UW-led group was able to create computer-designed molecules with shapes that nature would find impossible. “Because structure determines function, [those new shapes] open access to functions that don’t exist in any natural proteins,” Mulligan said. The peptides in this paper were created to prove the method works, but the team is using their designs and the algorithms they built to create small-protein drug candidates with a variety of different applications for human disease. Mulligan’s co-first authors Drs. Gaurav Bhardwaj and Christopher Bahl, all postdoctoral fellows in the lab of senior author Dr. David Baker of UW, are exploring potential peptide drugs that could help overcome antibiotic resistance and neutralize bacterial toxins implicated in food poisoning, for example. Drug design has a Goldilocks problem. In general, most existing drugs fall into one of two classes: First are small molecules like aspirin that can slip easily throughout the body’s small spaces, but whose small surface area means they often can’t be very specific in the way they bind to disease-related molecules — their targets. Second are drugs based on antibodies — disease-targeting proteins of the immune system — that can be stable and highly specific to their targets but tough to produce and too large to find their way to some targets. “Small-molecule drugs have their place and antibody drugs have their place, but between that you run into all of these targets that we often refer to in drug discovery as undruggable targets,” Correnti said. That’s where constrained peptides come in. Like the little bear’s porridge in the fairy tale, this class of small proteins could be just right, with small sizes that allow them to slip through barriers that block larger molecules and structures designed to be specific for a target, stabilized by multiple, crisscrossing chemical bonds. While there are some drugs that have been created based on naturally occurring constrained peptides, and it’s possible to synthesize such peptides in the lab, designing a new peptide from scratch to solve a particular problem is another beast entirely, the researchers said. “The challenge has been that we can’t design them. We can make them if we know what to make,” Mulligan said. The forte of the Baker group at UW is the use of computational and experimental methods to tackle problems in protein science, including the design of novel proteins with particular functions. Before this project, however, they weren’t able to design such small, constrained proteins, nor proteins that incorporated unnatural amino acids that are mirror images of their naturally occurring cousins. Besides making it possible to create new peptide shapes and, thus, functions, unusually shaped peptides like those the group designed could prove to be highly stable drugs, the investigators said. The human body’s protein-breakdown enzymes “don’t work very well on mirror-image amino acids, meaning these peptides will persist much longer,” Mulligan said. Some of the peptides the group designed are also circular, a form that exists in nature but was undesignable before this project. “From a drug perspective the reason this helps is that some of these enzymes start digesting from the ends,” Bhardwaj said. But a circle doesn’t have ends, he pointed out. First, the team created rough blueprints for their peptides that specified the shapes they would contain — say, two spirals of amino acids followed by a series of amino acids that folded into sheets — without dictating the particular sequences of the 15-50 amino acids that would create those shapes. Then, the team’s software began to zoom in on ways to create these shapes, starting with the rough backbone and then the specific sequences of amino acids, whether natural or unnatural, that would flesh out the backbone. The software, dubbed Rosetta and first developed by Baker, generated numerous possible amino acid sequences that could possibly form the shapes in each blueprint. Next, it found the handful that were most plausible to form the specified shape when the amino acid sequence folded up into its final 3-D conformation. The team synthesized the peptides designed with the new algorithms in their labs at the UW and Fred Hutch. They tested the peptides in tough conditions of high temperature and corrosive chemical baths to check their stability. Then came the nail-biter: proving that what they’d made in the lab was actually what they’d designed. The UW team is taking two approaches toward transforming their early-stage, constrained peptides into potential drugs. The first is reengineering the peptides they’ve already created to bind to a specific target. The other is using their new algorithms to design from scratch new peptides that will target a particular molecule involved in disease. Meanwhile, Correnti and the other members of Olson’s Project Violet effort continue to develop drug candidates based on constrained peptides starting from the opposite direction: modifying the function of peptides that already exist in nature. Project Violet’s best-known such drug is BLZ-100 Tumor Paint, which is built from a peptide from scorpion venom linked to a fluorescent molecule. Tumor Paint, now being tested in clinical trials, is designed to light up tumors so surgeons can see exactly where to cut to excise only diseased tissue and leave healthy tissue intact. The collaboration between the two groups is really special, Olson said.